Melissa Bowersock has written a variety of books across different genres. As someone who has both self-published and been traditionally published, she has an interesting approach to marketing that can help all writers. I have 4 romance novels, 2 that are Westerns (The Rare Breed, Superstition Gold) and 2 that are contemporary (Remember Me, Lightning Strikes). I like to think that my romances are more for thinking readers rather than the formulaic sexual tension novels. I believe my characters grow a lot during the course of finding love. The Blue Crystal is a fantasy sword-and-sorcery novel, much like Lord of the Rings. I have 2 action-adventure novels. Queen’s Gold is based on a past-life regression where a man tries to find ancient Aztec gold he hid in a previous incarnation. The Appaloosa Connection is a western in which a horse rancher and a sullen teenager go after horse thieves that are in cahoots with the Mexican army. Goddess Rising is a spiritual fantasy, inspired by a dream about a future when the world has been decimated by a geologic holocaust and the few people await a female savior to return them to greatness. The Pits of Passion (by Amber Flame) is a romance satire that lampoons every cliche ever written. It is a literal bodice-ripper, and not for the faint of heart. My last book, Marcia Gates: Angel of Bataan, is the biography of an Army nurse who was captured on Corregidor and spent 3 years in a Japanese prisoner-of-war camp in the Philippines. Although my books are inspired by various means, my motivation is that all the stories moved me and interested me and I felt like they were worthy of putting down on paper. I write what I like to read, paying no attention to current fads or commercial formulas. Sales have been by fits and starts. When I do a marketing push, I see more, but then they fall off. The sales on my non-fiction have been surprisingly good, so it must be word of mouth. The only benefit my traditionally published books had over my self-published ones was that they appeared in bookstores, markets and drugstores. (These were the 2 western romances.) There was no marketing program by the publisher except that; the only target was romance readers looking for that next book. Self-publishing is tougher in that respect, since I have to figure ways to bring my books to readers’ attention, but beyond that, the self-publishing process is pure joy. I love formatting my books, I love designing the covers and making all the decisions. 4. You’ve been self-publishing for about three years. How do you like it so far? I love self-publishing. If one of my books gets picked up by a traditional publisher, that will be great, but in the meantime I will self-publish as my first choice. There’s no waiting, no trying to tailor my story to a particular house and no compromising. I carry my books with me everywhere (keep them in my desk at work, keep them in the car, take with me when I travel) and whenever possible put them in people’s hands. I use Facebook and Twitter to announce new topics on my blog, contribute regularly to writer’s forums on LinkedIn and Goodreads.com. I also comment on other blogs. I reserve space at book fairs and give away bookmarks. I sponsor giveaway contests on Goodreads.com. So far, I’m finding that the blogs and the Facebook exposure seem to be working the best. Can’t think of any. I actually do not push terribly hard, though; I’m irritated when others try to “sell” me, so I don’t try to “sell” them too hard. How easy it is! I was intimidated by it at first, but it’s not brain surgery, and it’s actually fun! Can’t think of a thing. I’m very happy with what I’ve done. Get the word out any way you can. Make yourself visible. Appear in whatever venues you can and have giveaways. Getting the book out there is what drives word of mouth. Three novels: a ghost story, a western and a reincarnation-based story about the Holocaust. I market myself as writing and publishing books for discerning readers. I like to think my books make people think. 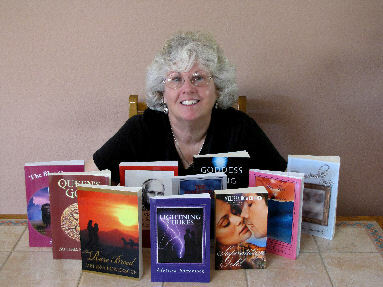 My website is www.newmoonrising.net and my blog is mjb-wordlovers.blogspot.com.